Hi all and welcome to my crafty spot. Here is my second post for today, an ATC made for the Craftymessers Daily Challenge on Facebook and it fits the 'Anything Goes' criteria for the ATCs and Cards with Attitude challenge currently running on their challenge blog. Surf's Up! is the title. My ATC was made with a Kraft cardbase with the top covered with a torn piece of Stampin'Up blue paper. The torn edge represents the surf. I stamped two surf boards in paper from Funky Hand and layered them onto the ATC. I stamped a pair of flip-flops from some Paperpmania paper and decorated them with a pink gem on each flop-flop. 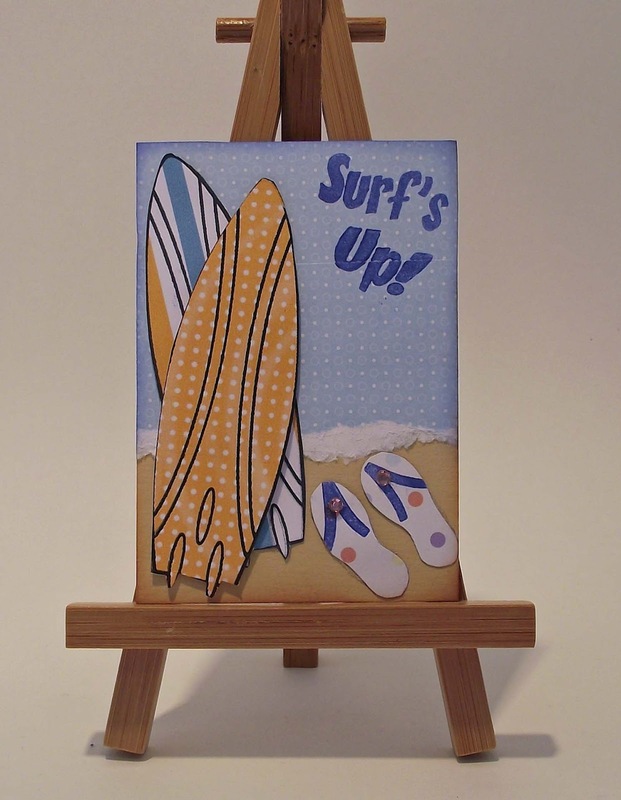 To finish the card I stamped 'Surf's Up' in the top right-hand corner and rubbed the edges with Versa Colour Royal Blue and Brown ink. All stamps used come from Stamps of Life. I am fairly new to ATCs and I am still learning, but I am happy with this little beach scene on such a small canvas.